1893. 300 hp alternator. Barcelona Electricity Supply. 1894. 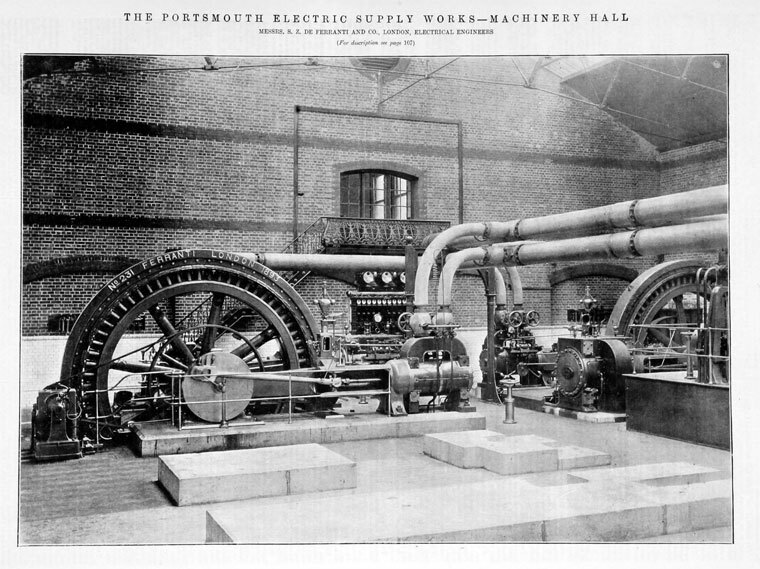 Machinery Hall, Portsmouth Electric Supply Works. 1895. 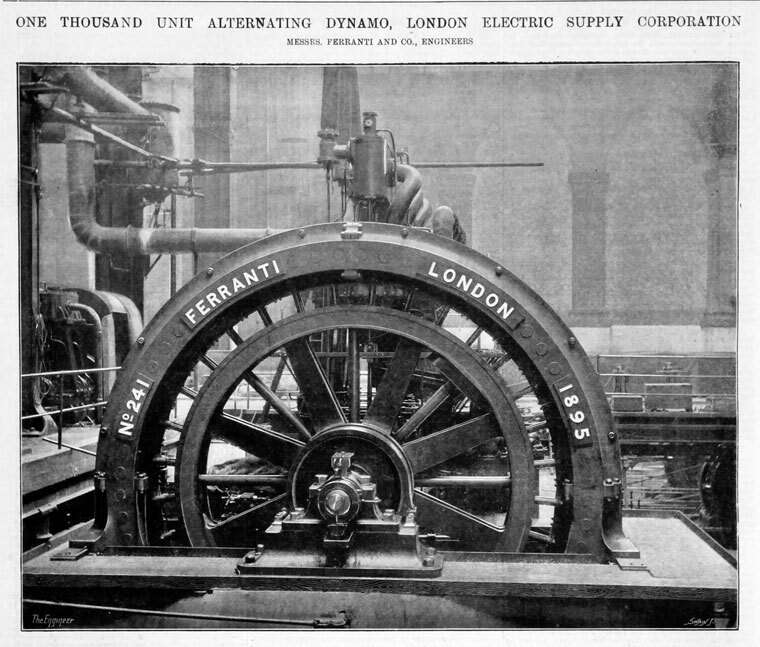 Alternating Dynamo for the London Electric Supply Corporation. 1897. 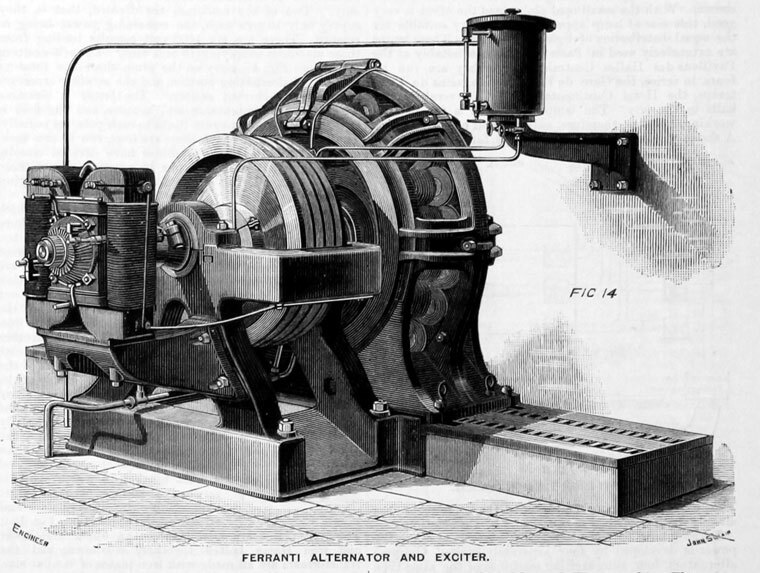 Combined engine and alternator at Bolton. 1933. Tail End Booster, Removed from Case. 1933. Single and Three Phase Moving Coil Regulators. December 1951. Cathode Ray Tubes. September 1953. 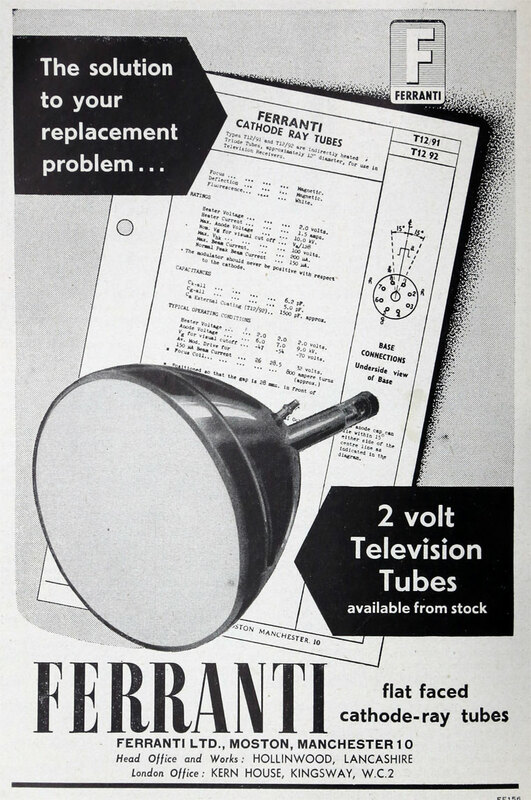 2-Volt television Tubes. 1955. Valves and television tubes. 1959. 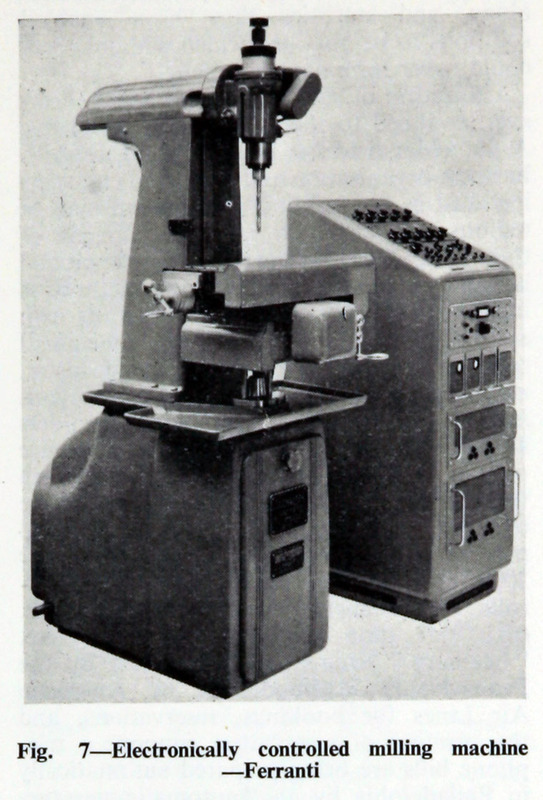 Precision Milling Machine with Ferranti Three Dimentional Control Equipment. 1959. 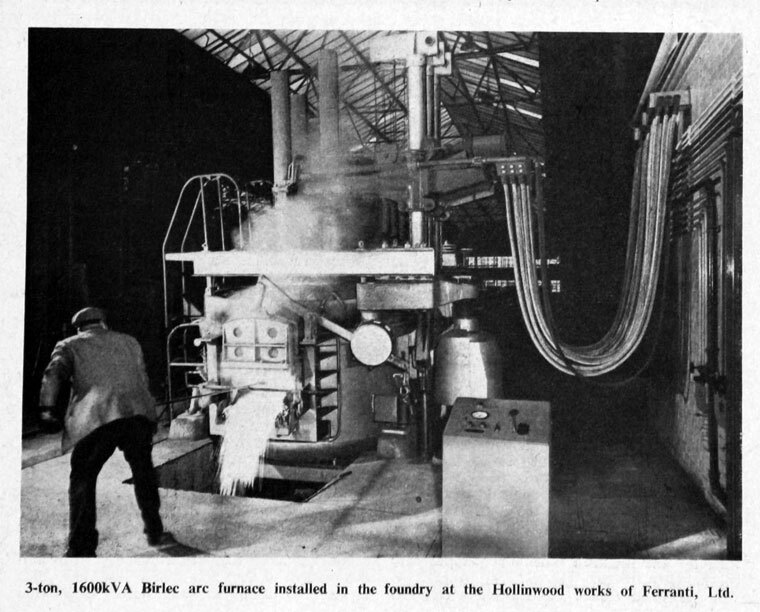 3 ton Birlec arc furnace at the Hollinwood Works. London office previously of 180, Fleet-streeet, EC4 moved to Bush House, Aldwych, W.C.2. (1925). 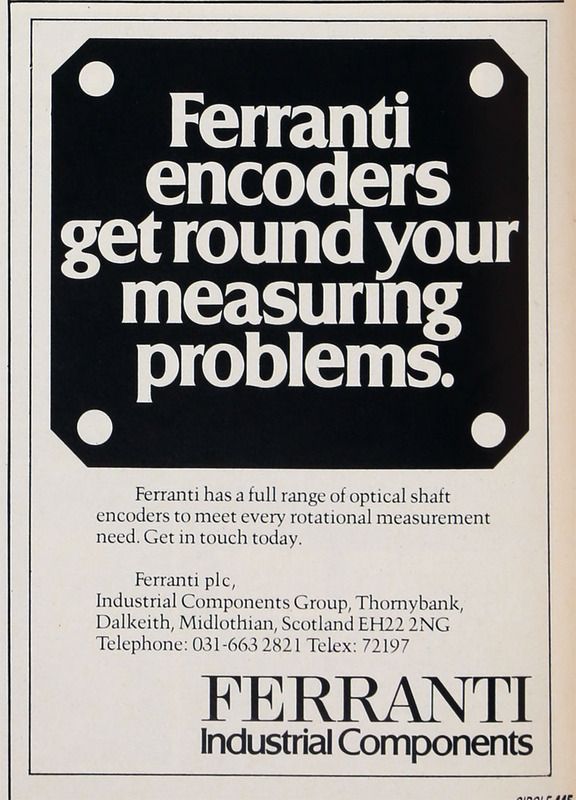 Ferranti and Co was a major UK electrical engineering and equipment firm, latterly known primarily for defence electronics and power grid systems. 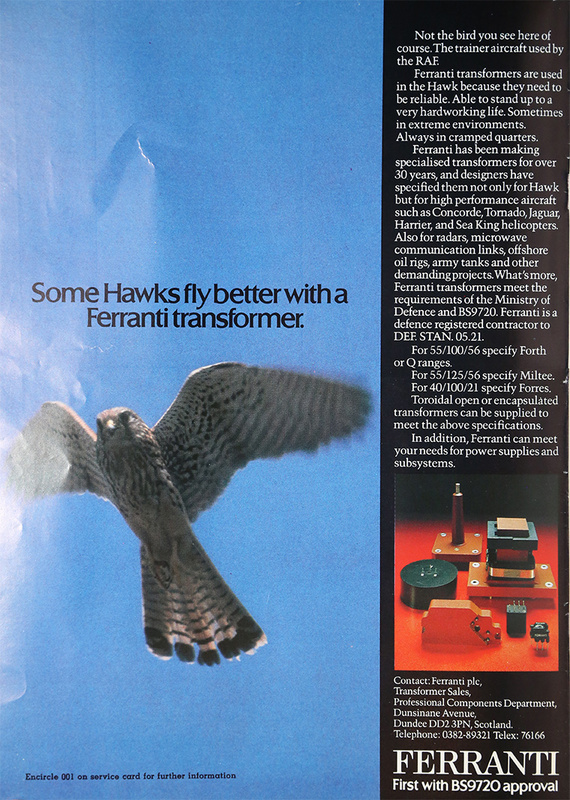 Also famous in the computer industry for building the second commercial computer, the Ferranti Mark I, the beginnings of a business which lasted until the 1970s. 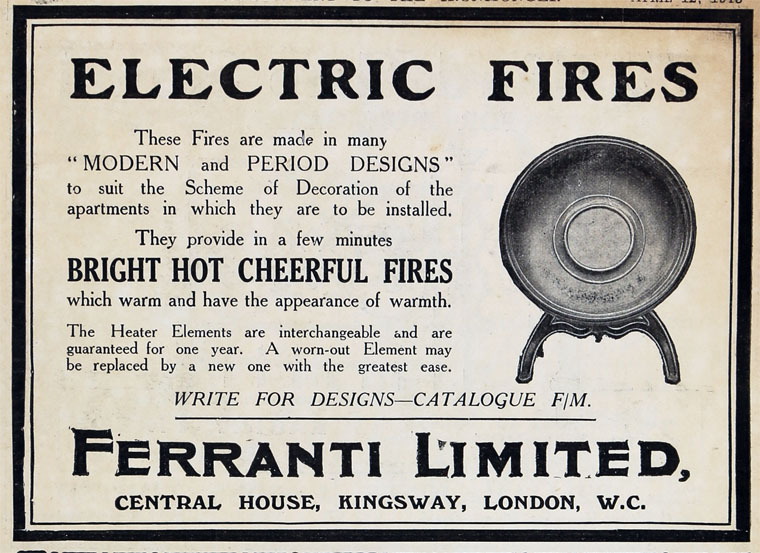 1882 Sebastian Ziani de Ferranti set up in business in London, designing various electrical devices. His early choice of the A.C. rather than the D.C. system made him one of the few experts in this system in the UK. 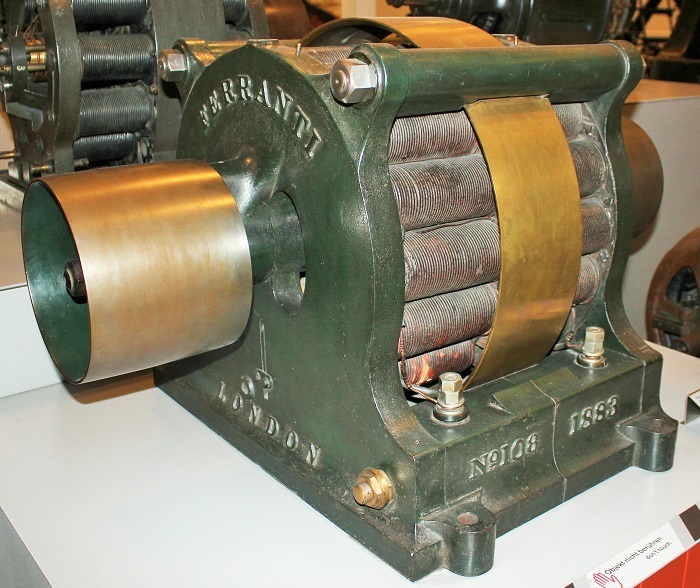 With Alfred Thompson and Francis Ince, he formed Ferranti, Thompson and Ince to manufacture alternators under licence from Sir William Thomson. 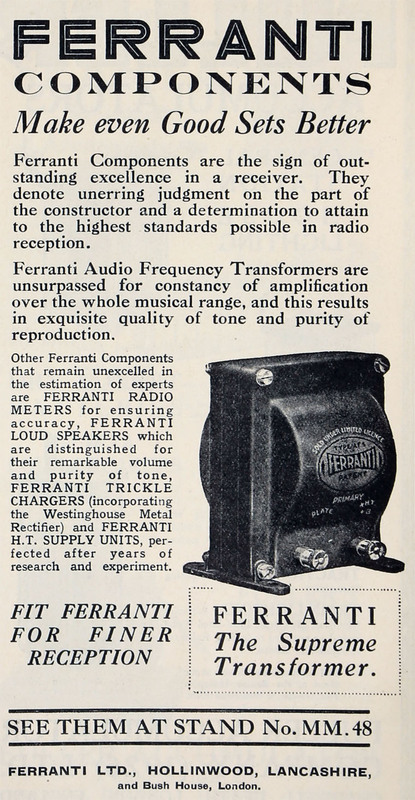 1883 Ferranti, Thompson and Ince was wound up at the end of the year and its affairs amalgamated with the Hammond Electric Light and Power Supply Co. Sebastian bought back his own patents and set up a company called S. Z. de Ferranti in partnership with C. P. Sparks and others. 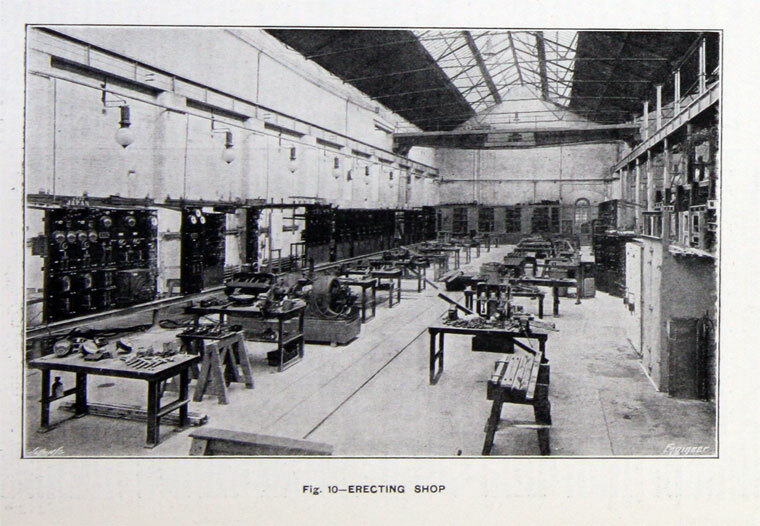 c.1885 Sebastian Ferranti was brought in by the promoters to overhaul the Grosvenor Galley Electrical Lighting Co installation. 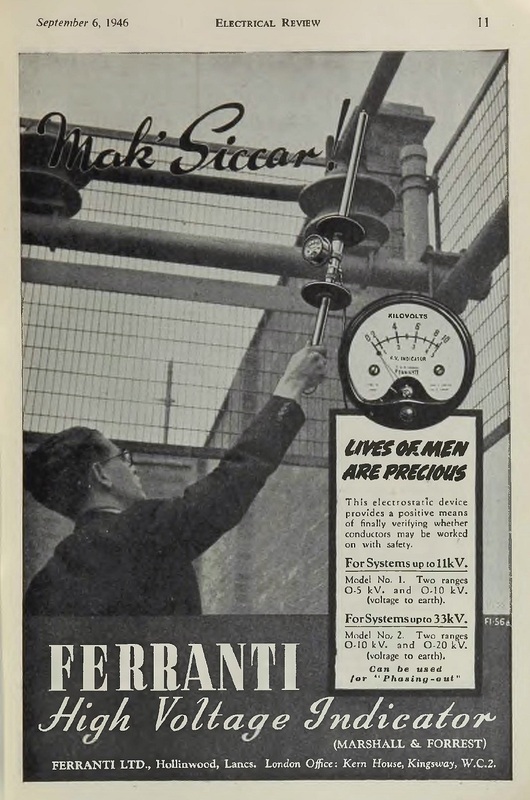 Ferranti was apparently the first to suggest that power stations should be outside the city, at a point convenient for fuel and water supply and that the power should be transmitted into the city by high-voltage alternating currents. 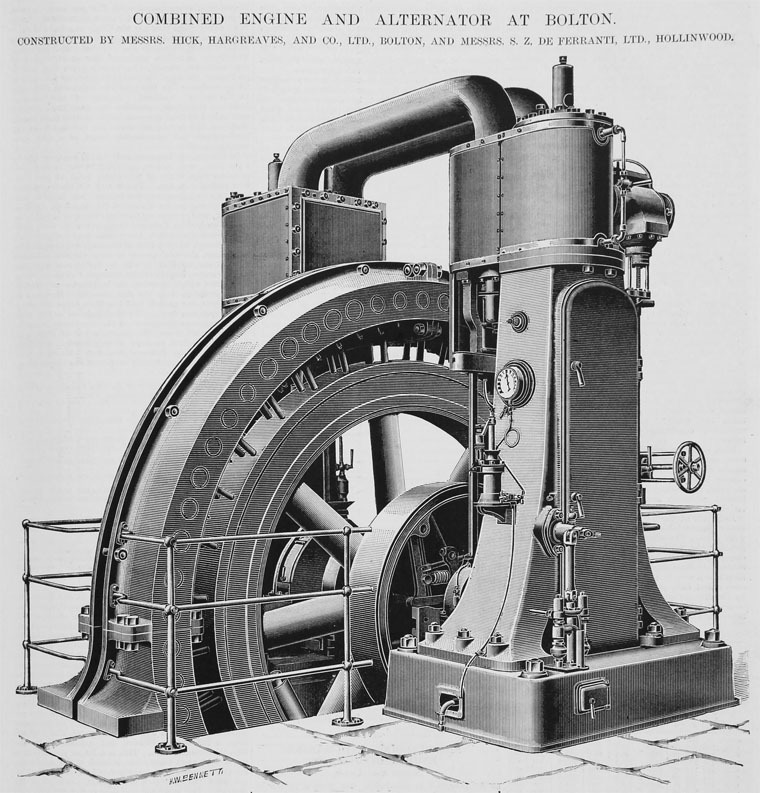 1887 The London Electric Supply Corporation (LESCo) employed Sebastian Ziani de Ferranti to design their power station at Deptford. He designed the building, the generating plant and the distribution system. 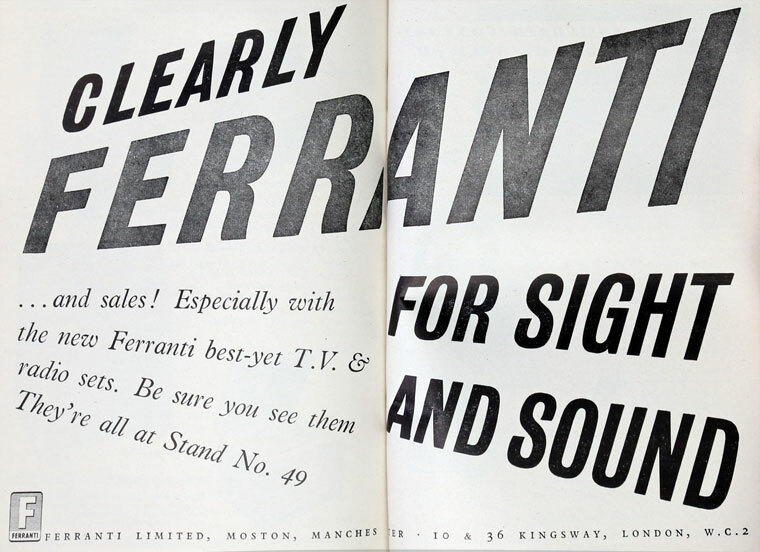 The company dispensed with Mr Ferranti's services - unfortunately for him there were no other British customers for his type of equipment so his company struggled for several years. 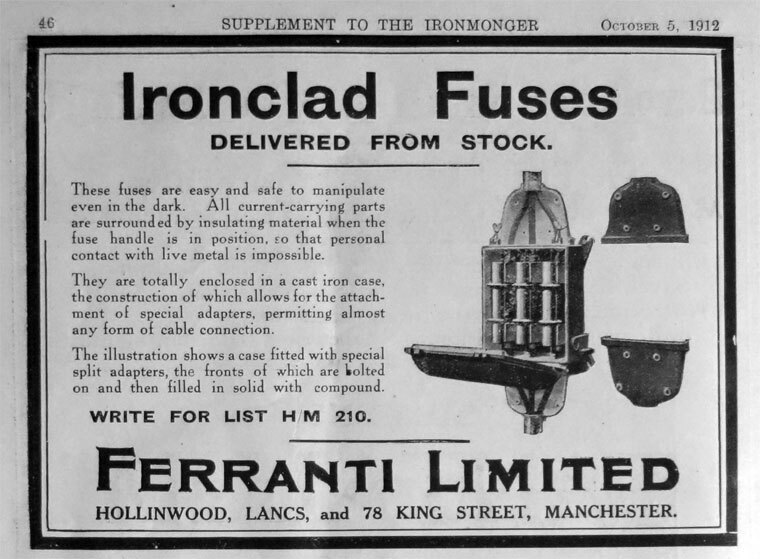 Ferranti sold his patents for high-pressure cables to the British Insulated Wire Co, providing useful collateral against the bank loans on which the firm relied. 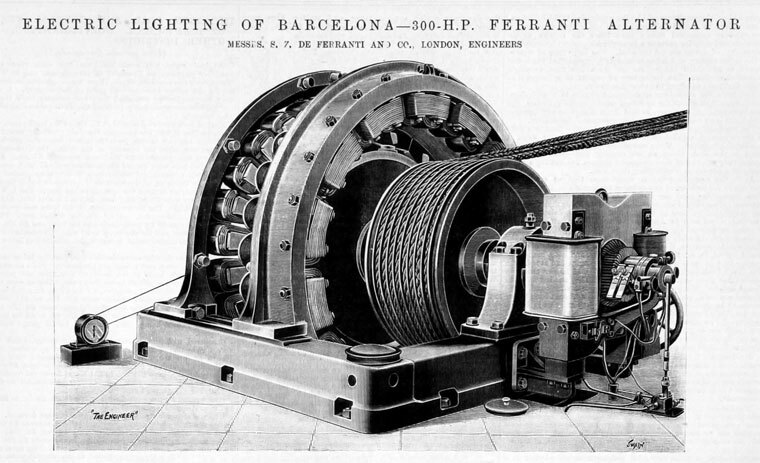 1896 Success followed and Ferranti started producing electrical equipment for sale. Soon the company was looking for considerably more room. 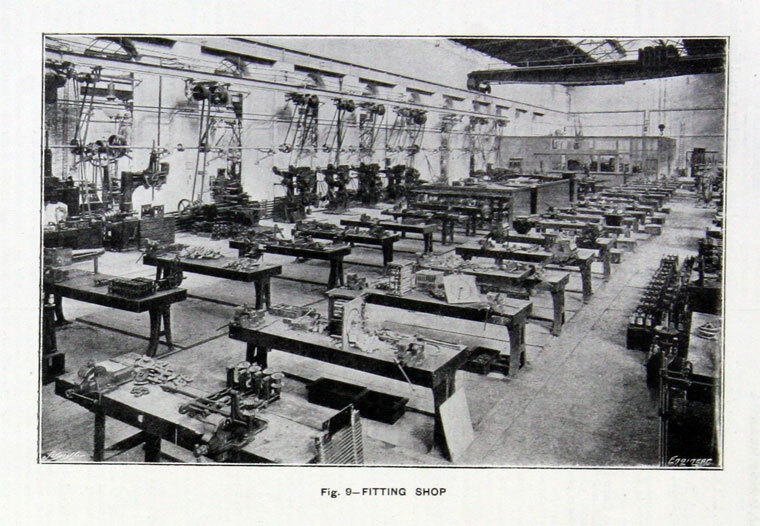 Prices in the London area were too high, so the company moved to Hollinwood in Oldham, Lancashire. 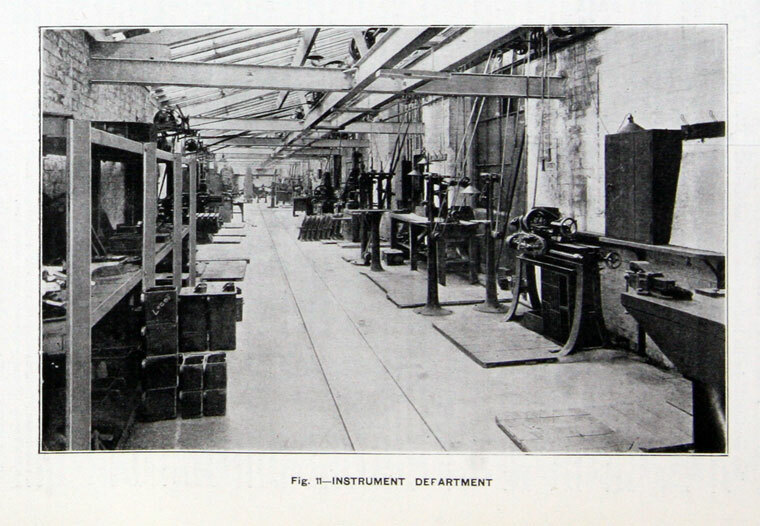 1897 Production began at Oldham. 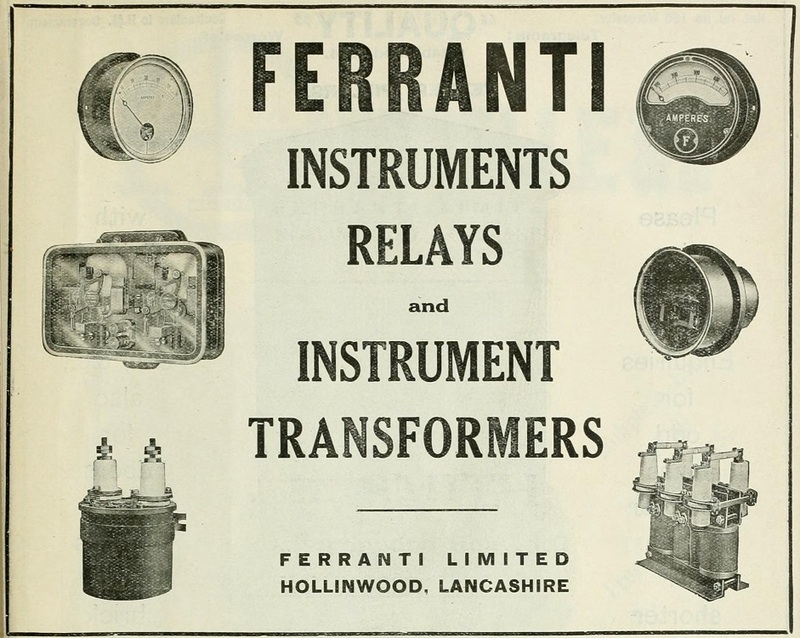 1901 Ferranti Ltd registered; acquired the whole undertakings and assets of S. Z. de Ferranti Ltd.
1903 Ferranti Ltd was in financial difficulties (largely because of its activities in steam engines and dynamos). At the instigation of the debenture stockholders, the company went into voluntary receivership. 1905 A Scheme of Reconstruction was established. 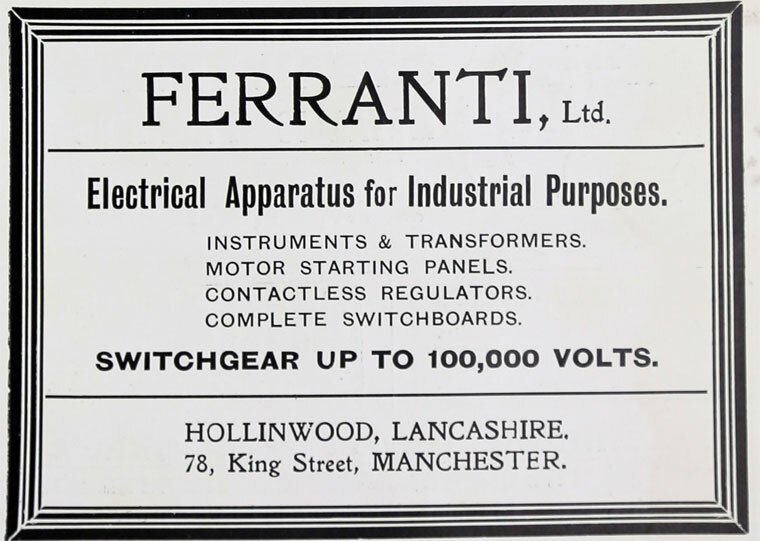 Ferranti Ltd was re-launched but focussed on the manufacture of Switch Gear, Transformers and Instruments. The company registered on 27 February, in reconstruction of a company of similar title, to acquire a business of electrical, mechanical and general engineers. Sebastian Ziani de Ferranti took a less active role in the running of this company. Andrew Tait elected Chairman (to 1927, Vice-Chairman 1927-1953). 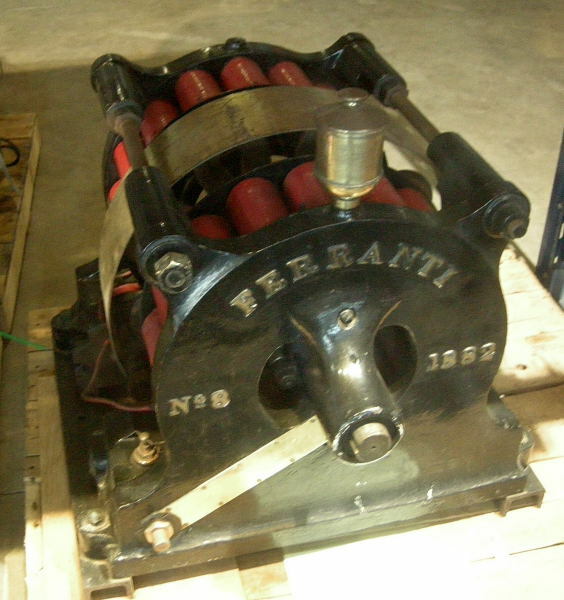 By the end of the decade Ferranti had amassed 176 patents for such things as the alternator, high-tension cables, circuit breakers, transformers and turbines. 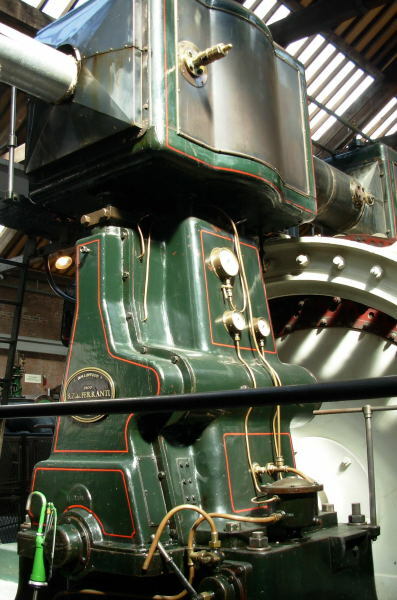 1910 Through the early part of the century, power was supplied by small companies, typically as an offshoot of plant set up to provide power to local industry. 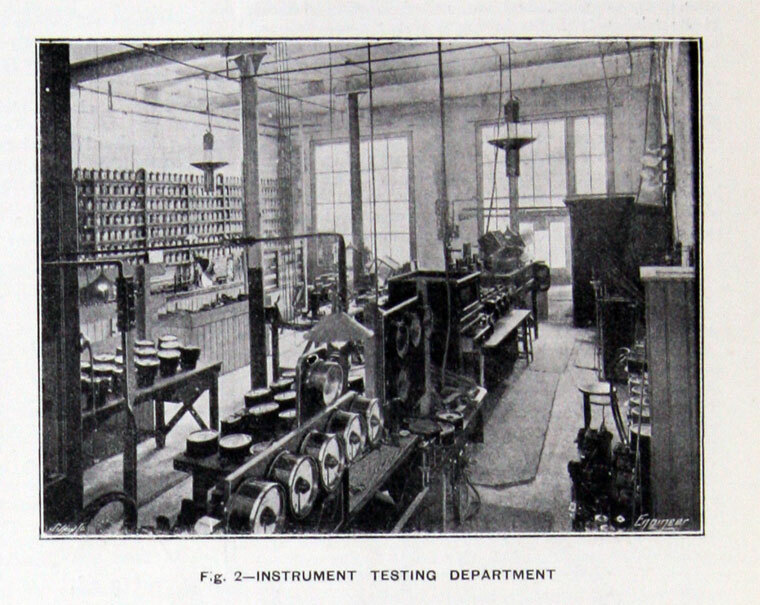 Each plant supplied a different standard, which made the mass production of electrical equipment for home users rather difficult. 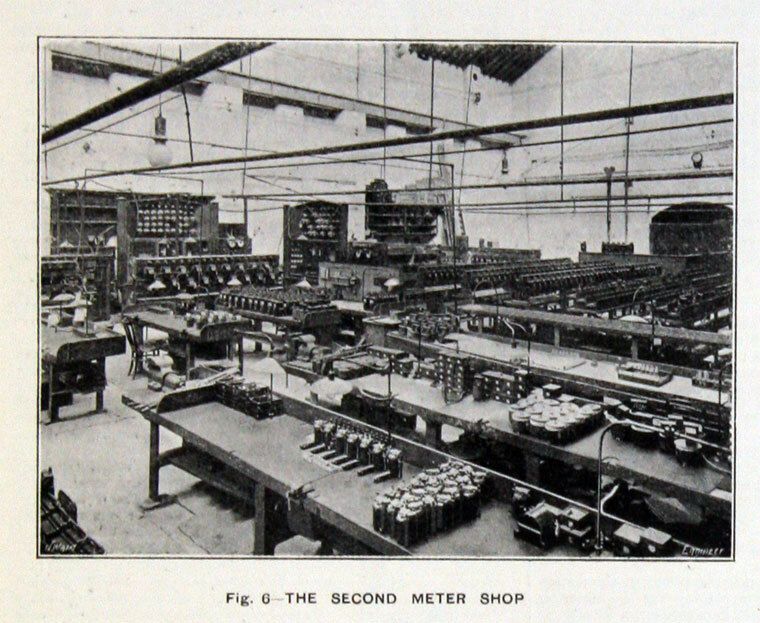 Ferranti started an effort to standardize the power supply, which eventually culminated in the National Grid in 1926. 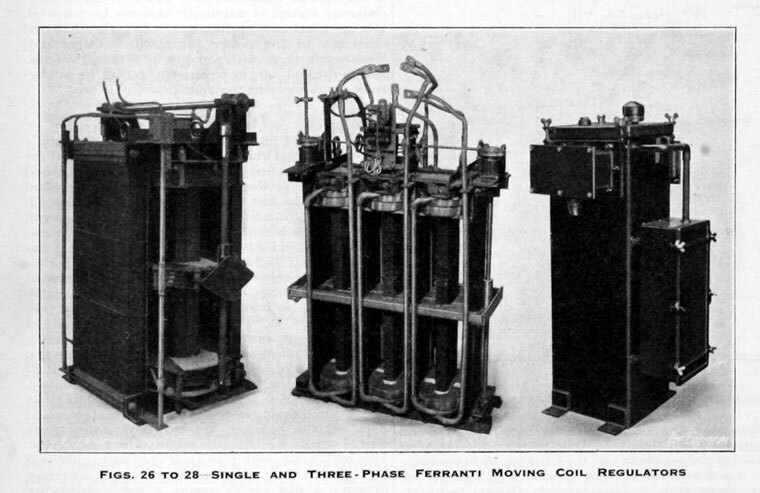 1913 Sold its switchgear patents and stock to Ferguson Pailin and Co. Samuel Ferguson and George Pailin had worked for Ferranti as switchgear engineers. 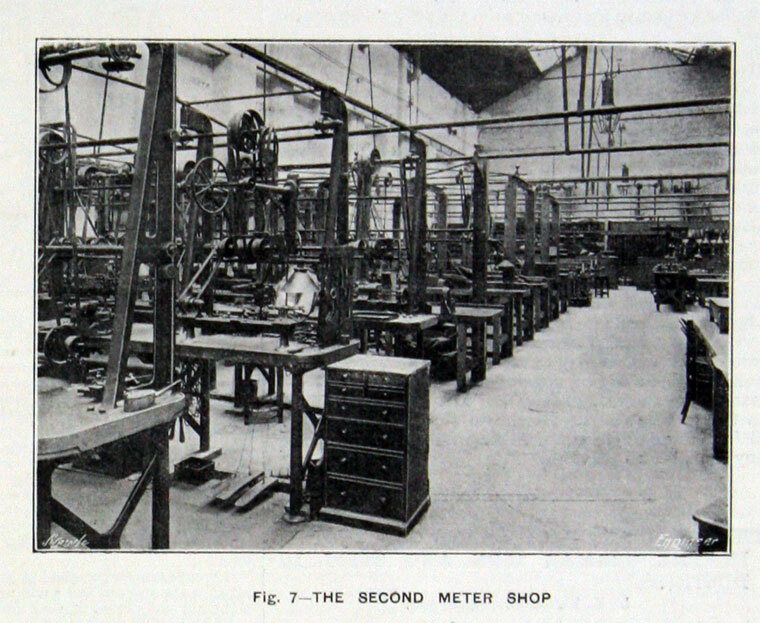 They left in 1913 to set up their own switchgear business at a factory in Openshaw, Manchester. 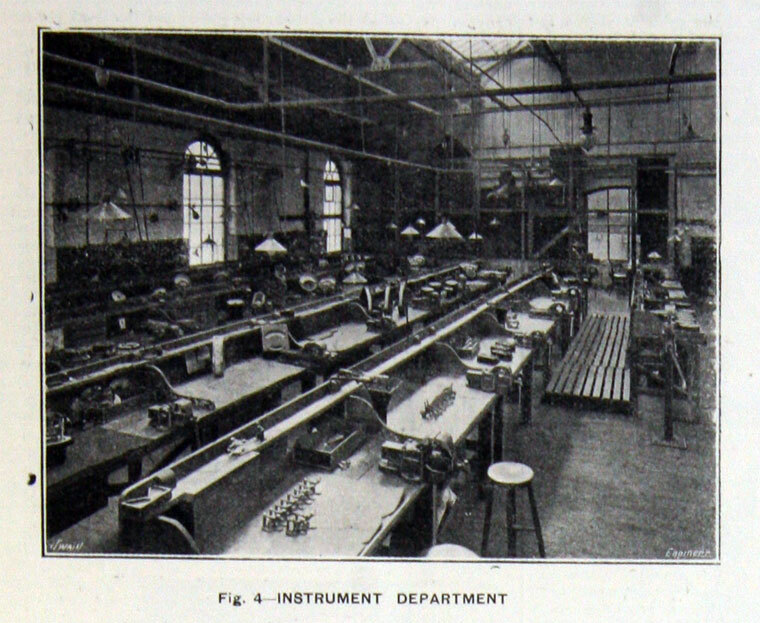 1930 Electronics Department set up to manufacture electronic components, which at that time were being manufactured by the Instrument Department. 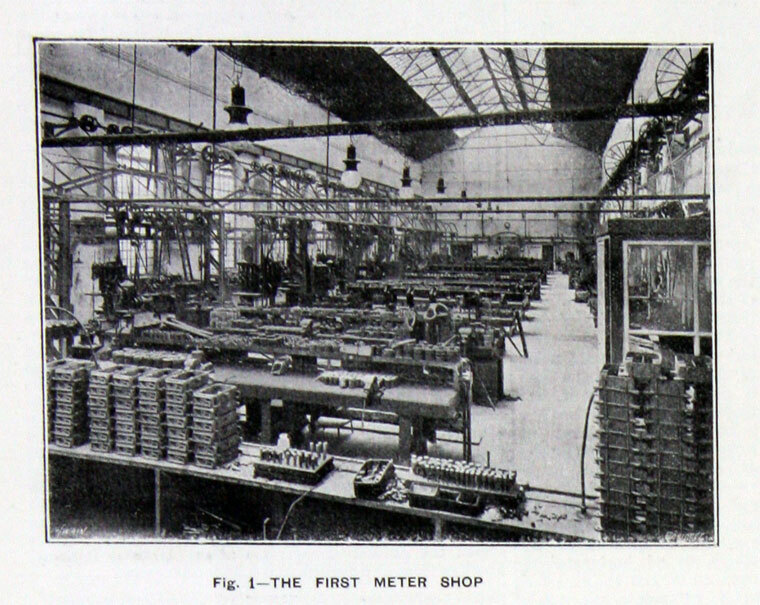 1935 Radio factory at Moston, Manchester opened. 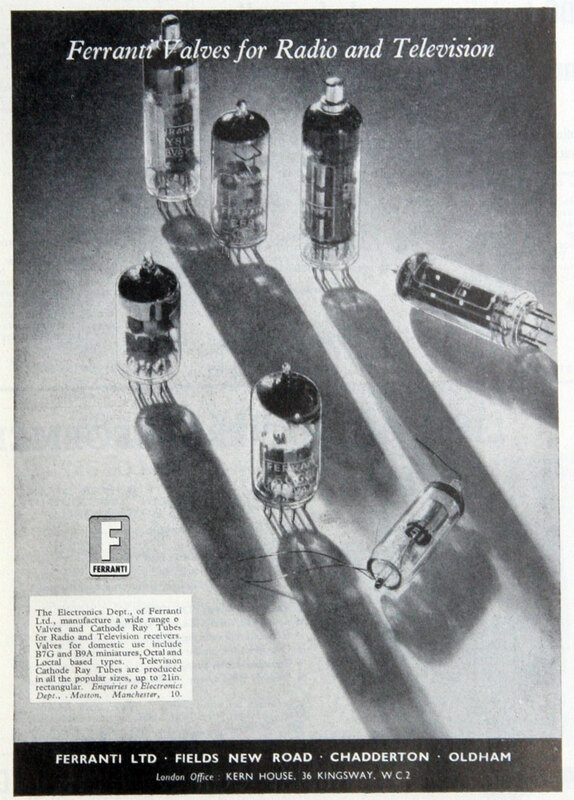 1936 Started production of cathode ray tubes and television receivers. 1937 Domestic Appliance Department moved to Moston; TV production began. 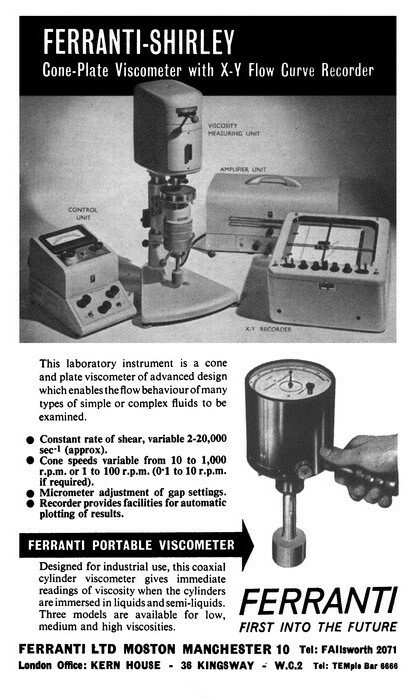 Ferranti Instruments, also based at Moston, developed various items for scientific measurements, including one of the first cone and plate viscometers. 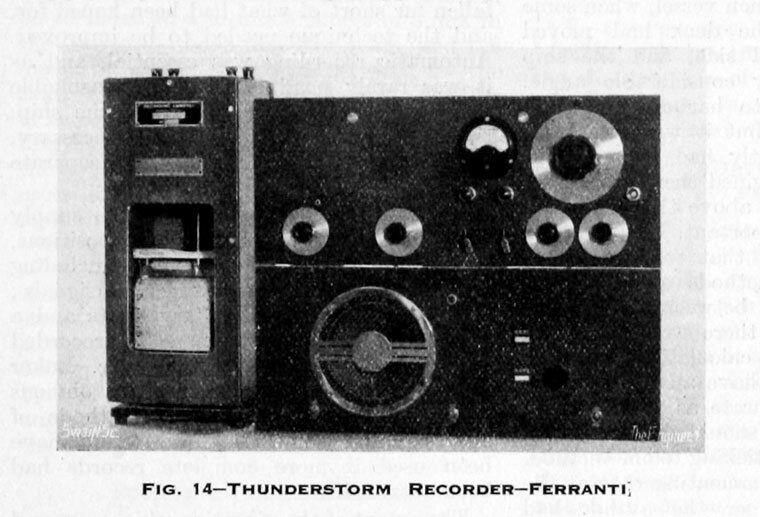 WWII During the war, Ferranti became a major supplier of electronics, and was heavily involved in the early development of radar in the United Kingdom. 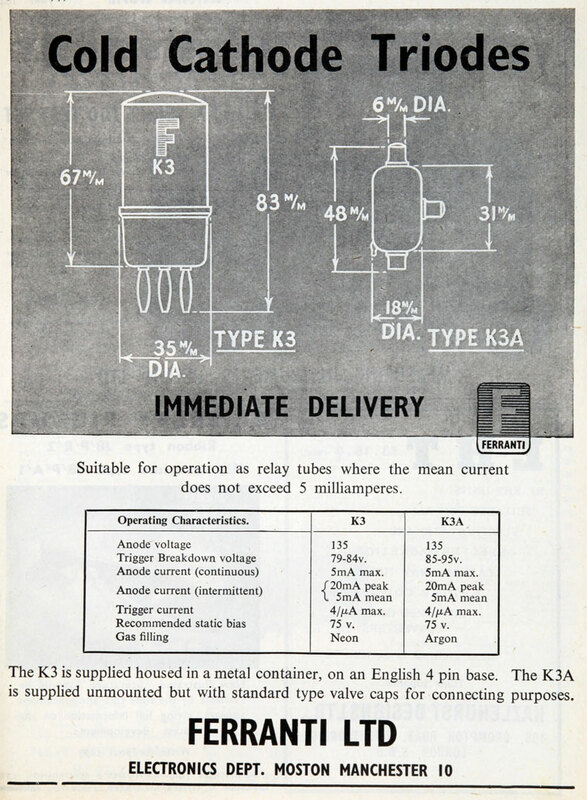 In the post-war era this became a large segment of their company, with various branches supplying radar sets, avionics and other military electronics, both in the UK and their various international offices. 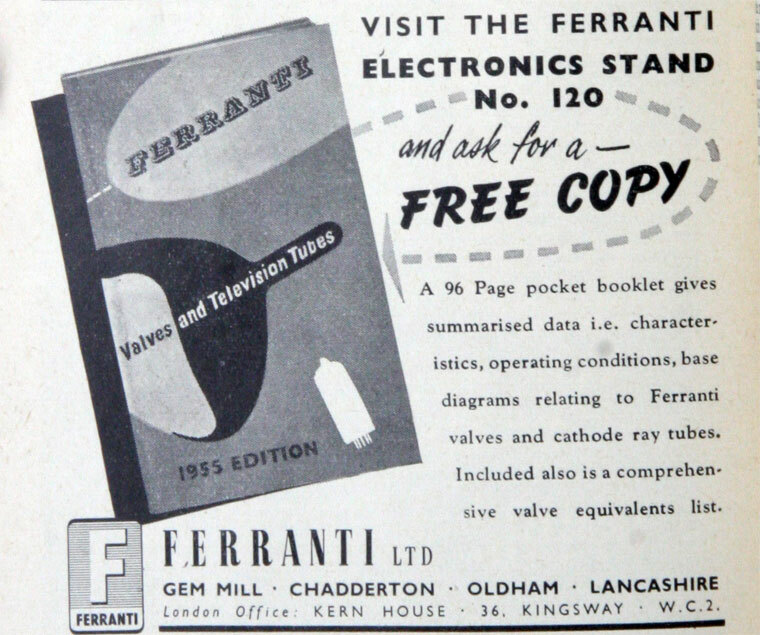 Valve production was expanded to supply other companies as well as Ferranti. 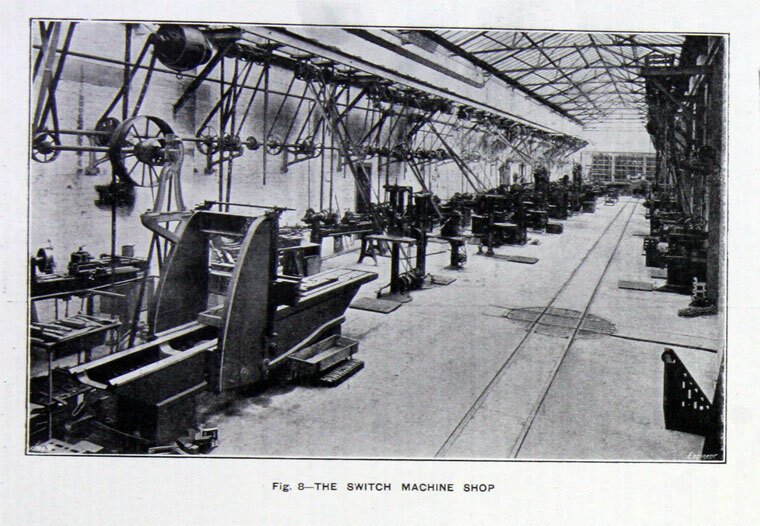 Other factories were at Oldham, Wythenshawe, Cheadle Heath and Gorton. Eventually branch-plants were set up in Edinburgh, Dalkeith, Aberdeen, Bracknell and Cwmbran as well as Germany and the U.S.A. and several British Commonwealth countries including Canada, Australia and Singapore. 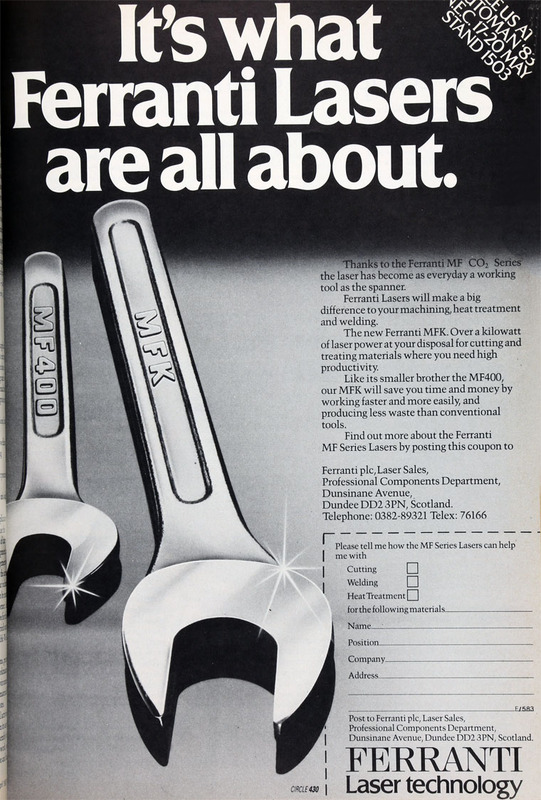 1946 Began to supply valves to other makers of sets. 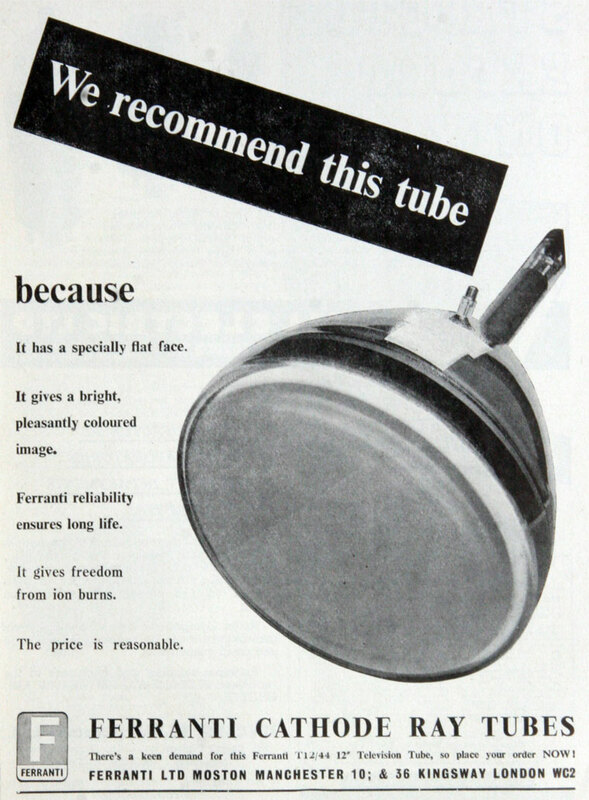 1948 General supplier of tubes. 1949 The Computer Group was formed. Ferranti joined with various university-based research groups to develop computers. Their first effort was the Ferranti Mark I, with about nine delivered between 1951–1957. 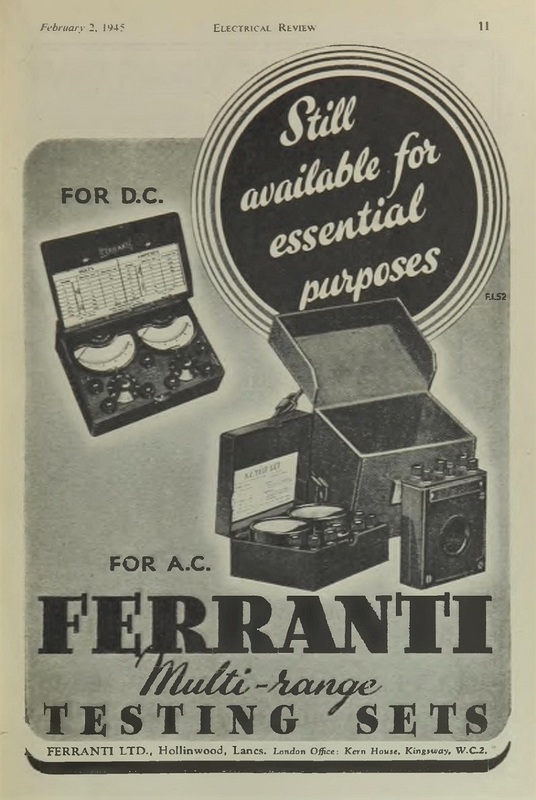 1955 Ferranti had been involved in production of electronic devices including Cathode Ray Tube devices and germanium semiconductors for some time before it became the first European company to produce a silicon diode. 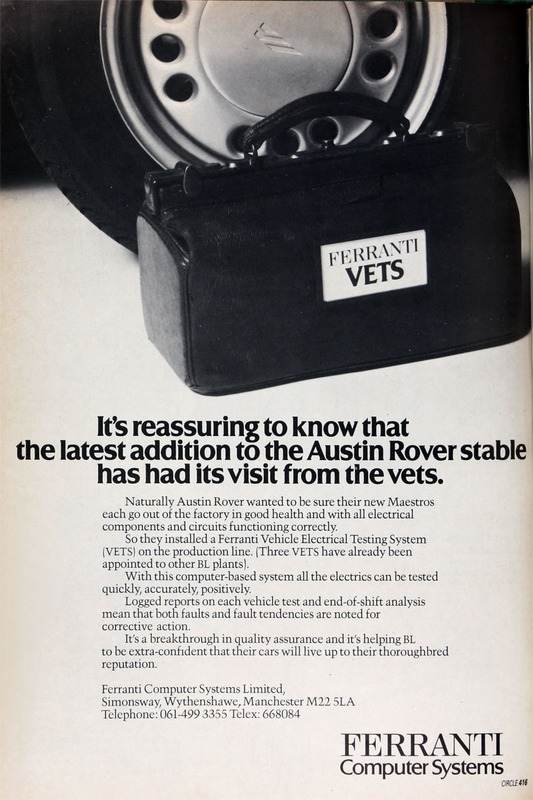 1956 The Pegasus computer was introduced and became Ferranti's most popular valve (vacuum tube) system, with 38 units sold. 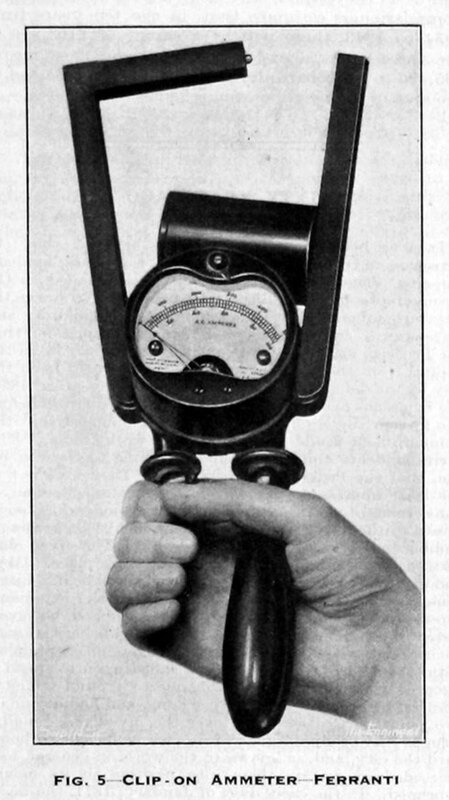 In collaboration with the University of Manchester Ferranti built a new version of the famous Manchester Mark I that replaced about half of the valve diodes with solid state diodes, which allowed the speed to be increased dramatically as well as increasing reliability. 1957 Ferranti offered the result commercially as the Mercury, and eventually sold nineteen in total. 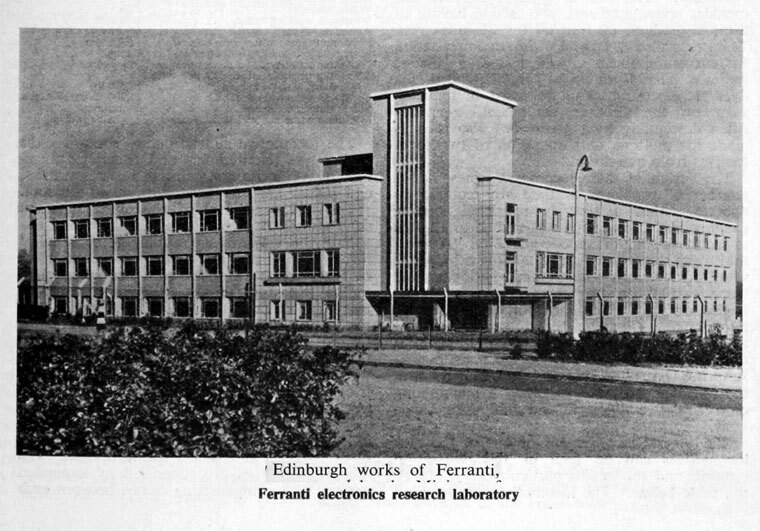 Although a small part of Ferranti's empire, the computer division was nevertheless highly visible. 1958-62 Work on a completely new design of computer, the Atlas, started soon after the delivery of the Mercury, aiming to dramatically improve performance. 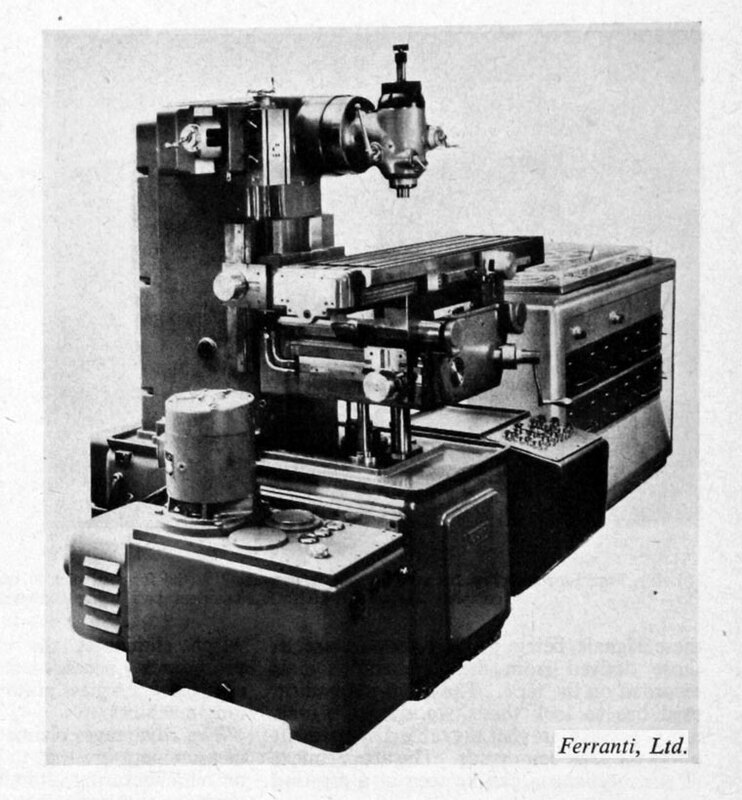 The machine first ran in 1962, and Ferranti eventually built three machines in total. 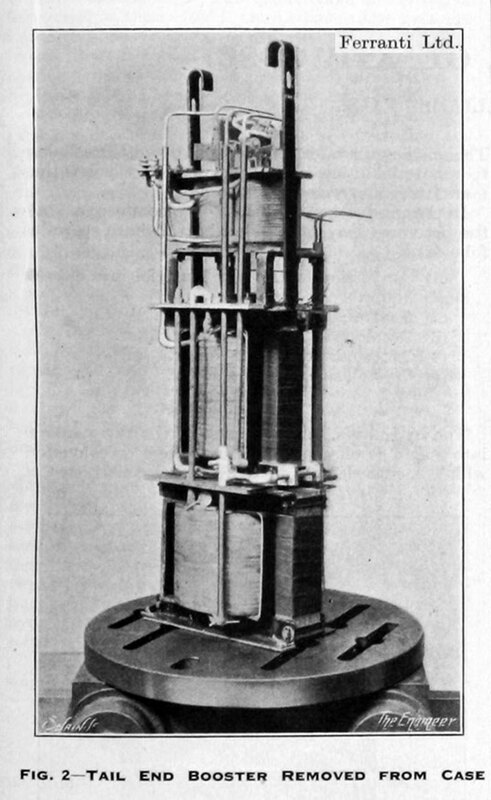 A version of the Atlas modified for the needs of the University of Cambridge Mathematical Laboratory led to the Titan (or Atlas 2), which was the mainstay of scientific computing in Cambridge for nearly 8 years. 1963 The Computer Department was sold to International Computers and Tabulators Limited (ICT). 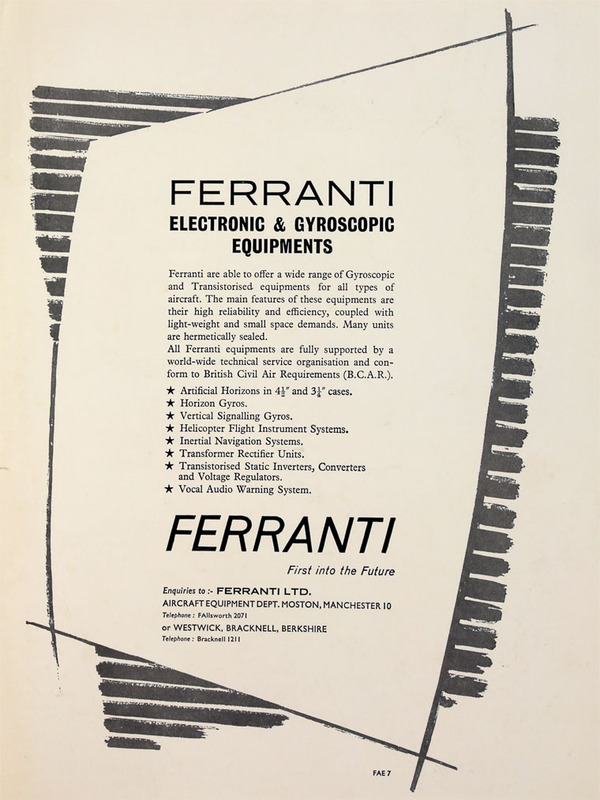 By this time, Ferranti's mid-size machines were no longer competitive but efforts to design a replacement had bogged down. Into this void stepped the Canadian division, Ferranti-Packard, who had used several of the ideas under development in England to produce very quickly the Ferranti-Packard 6000. After studying several options, ICT selected the FP 6000 as the basis for their ICT 1900 line which sold into the 1970s. 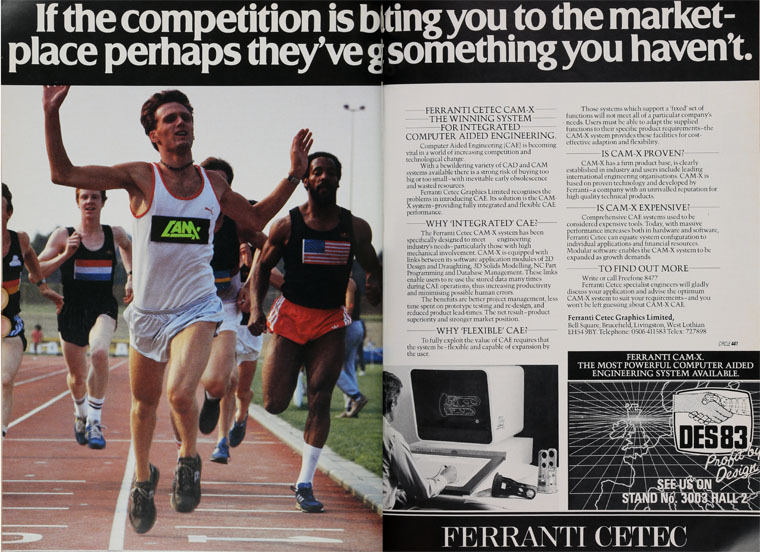 The deal with ICT excluded Ferranti from the commercial sector of computing but left the industrial field free. Some of the technology of the FP 6000 was later used in Ferranti's Argus range of computers. The first computer was the Argus 200 which was developed at the Wythenshawe factory. 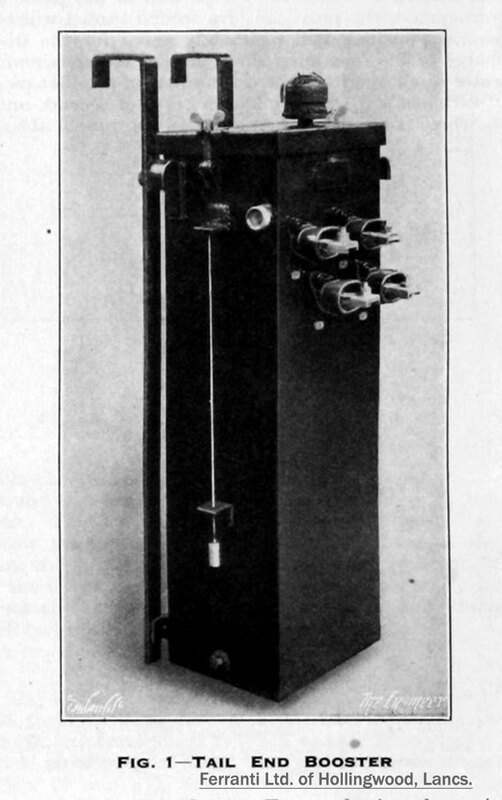 The Argus 100 and 300 followed, aimed at process control applications. Jodrell Bank used an Argus 100 to control its Mark II telescope in 1964, which was replaced by an Argus 400 in 1971. These computers were all built with discrete germanium transistors. 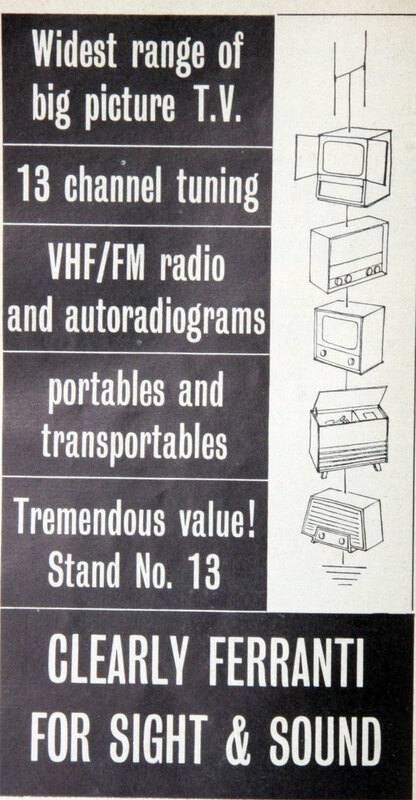 Both the ICT 1900 series and the Argus had 24 bit words. 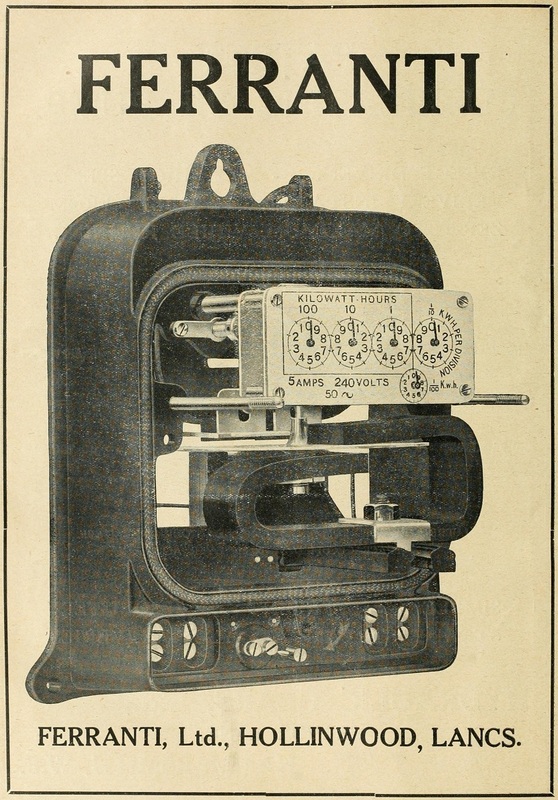 The assembler was almost identical, but with slightly different mnemonics (1900 assembler was called PLAN, Ferranti Argus assembler was called APRIL.) The ICT 1900 series advanced with a COBOL compiler, to become a successful commercial computer for many years. 1967 Closure of the Distribution Transformers Department. 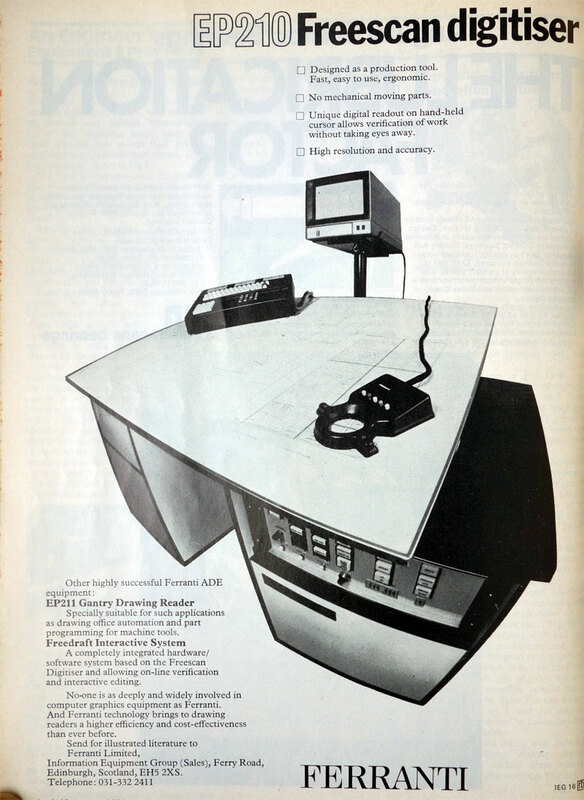 1968 The Argus 500 was the first in the range to use integrated circuits and had considerably more computing power than the earlier machines. It allowed the use of Fortran and, later, CORAL compilers and had huge success in real time applications, from Command and Control centres, to industrial control. The Argus 400 was a version of this with reduced facilities. 1970s Early in the decade Ferranti designed the Argus 700; this also achieved international success for industrial and military applications. 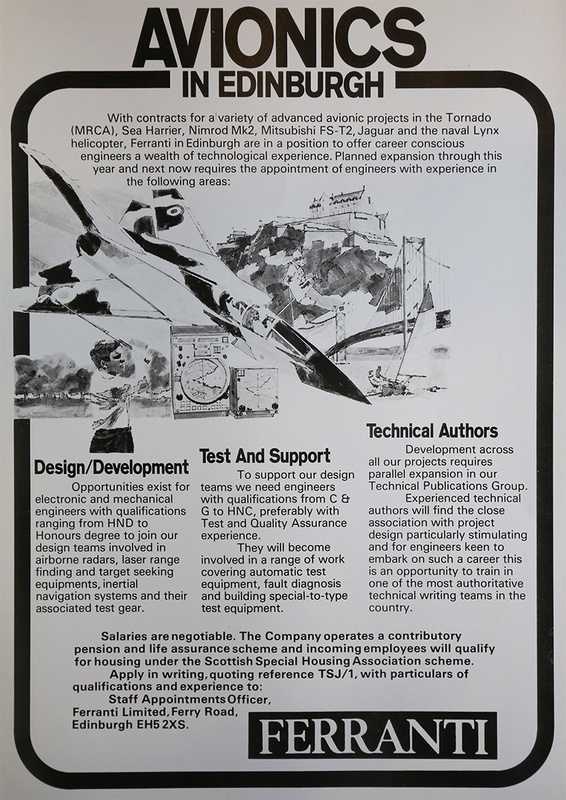 Meanwhile in Bracknell, Digital Systems division was developing a range of mainframe computers for naval applications. Early computers using discrete transistors were the Hermes and Poseidon and these were followed by the F1600 in the mid 1960's. 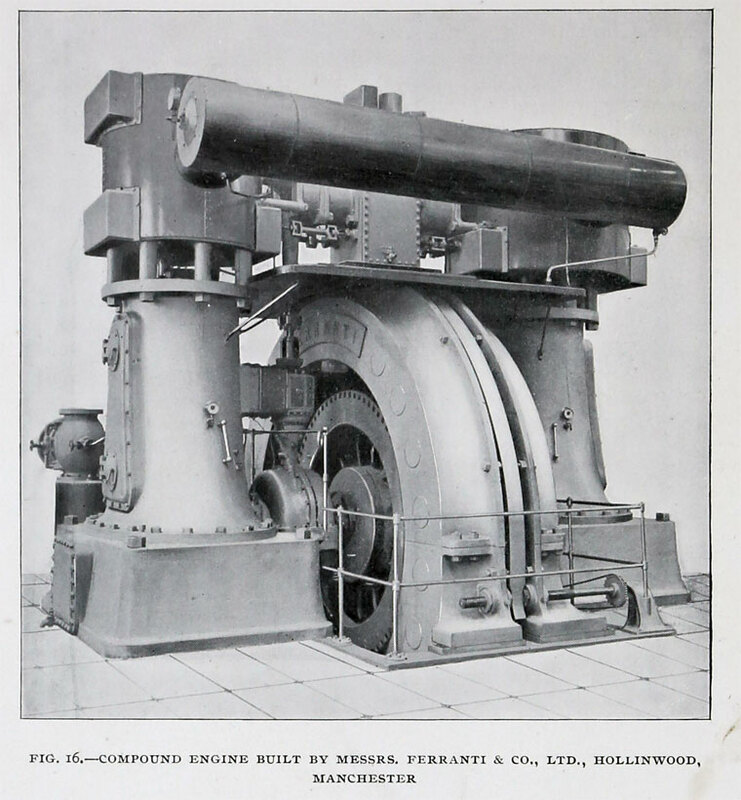 Some of these machines remained in active service on naval vessels for many years. The FM1600B was the first of the range to use integrated circuits and used in many naval and commercial applications. The FM1600D was a single rack version of the computer for smaller systems. An airborne version of this was also made and used aboard the RAF Nimrod. The last in the series was the FM1600E which was a redesigned and updated version of the FM1600B. 1974 the Transformer Division ran into financial difficulties. As a result, the Government, through the National Enterprise Board, injected £15 Million into Ferranti in return for a 50% stake in the company leading to a reduction in the Ferranti family shareholding to a minority of the total. A new Managing Director and new Chief Executive were appointed. 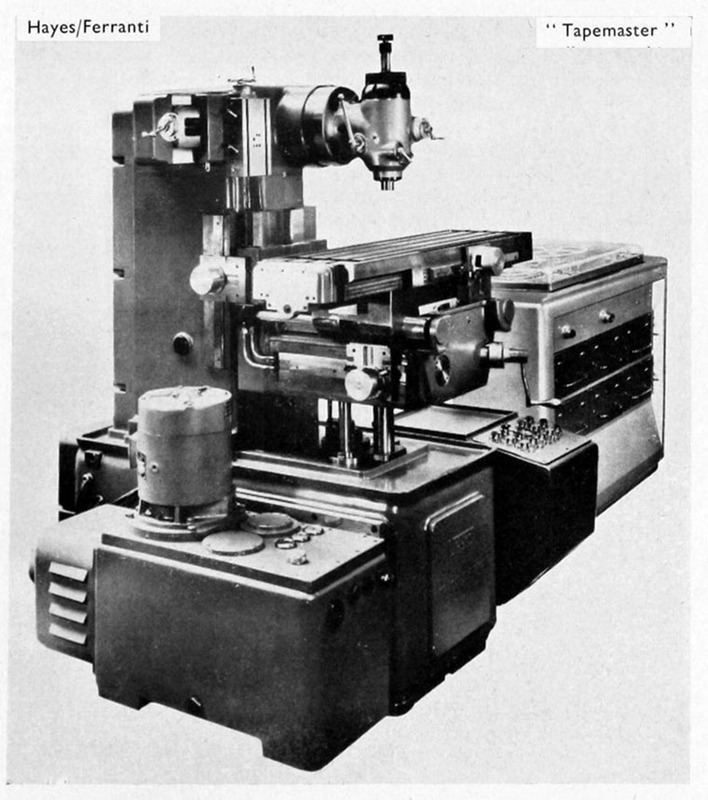 1974 Introduced an improved machine to measure more accurately surface profiles. 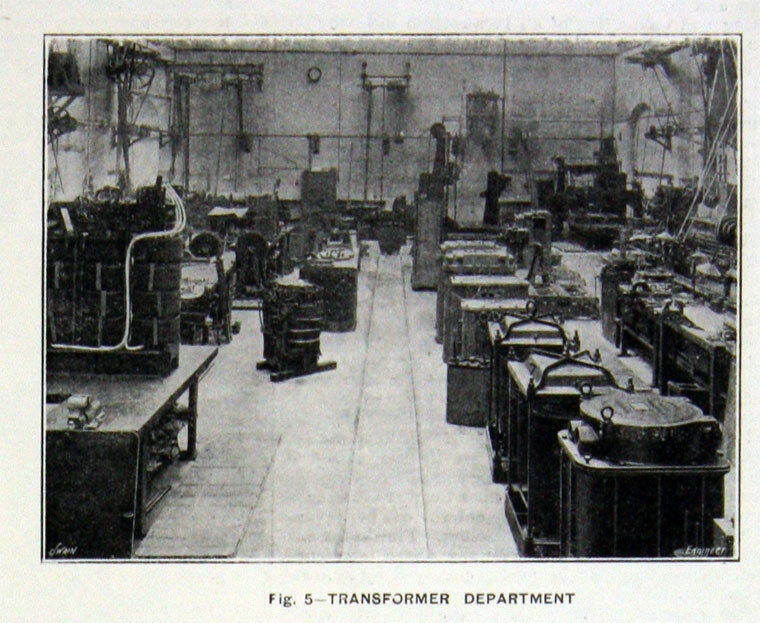 1975 The Transformer Division was closed. 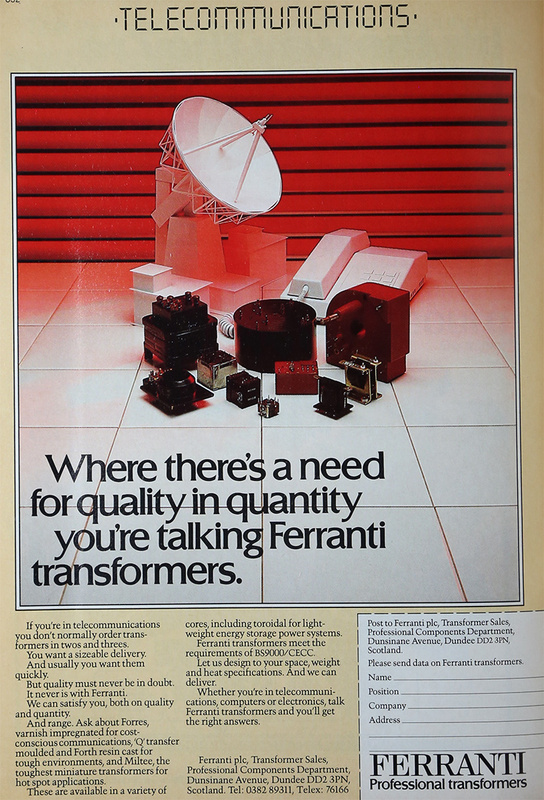 Ferranti Semiconductor Ltd. produced a range of silicon bipolar devices including, in 1977, the F100-L, an early 8-bit single chip microprocessor with 16-bit addressing. An F100-L was carried into space on the amateur radio satellite UoSAT-1 (Oscar 9). 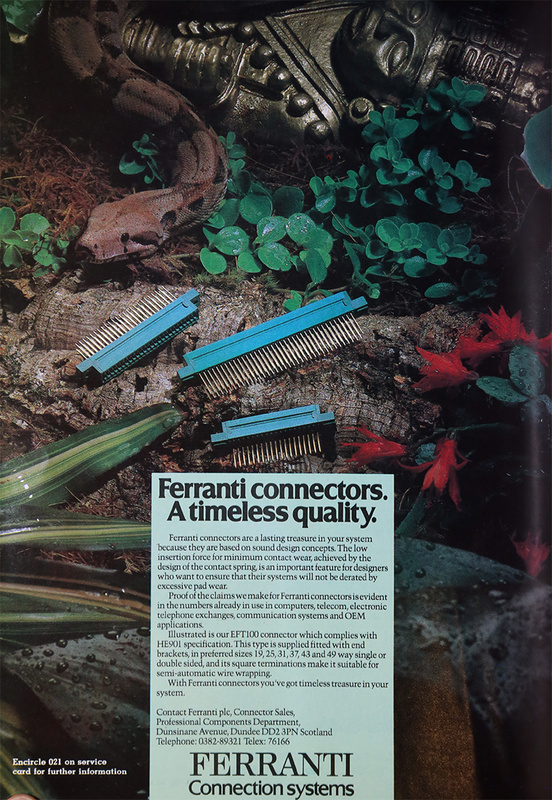 Ferranti's ZTX series bipolar transistors gave their name to the inheritor of Ferranti Semiconductor's discrete semiconductor business, Zetex plc. In the mid-eighties, Ferranti produced some of the first large uncommitted logic arrays (ULAs), used in home computers such as the Acorn Electron and BBC Microcomputer. 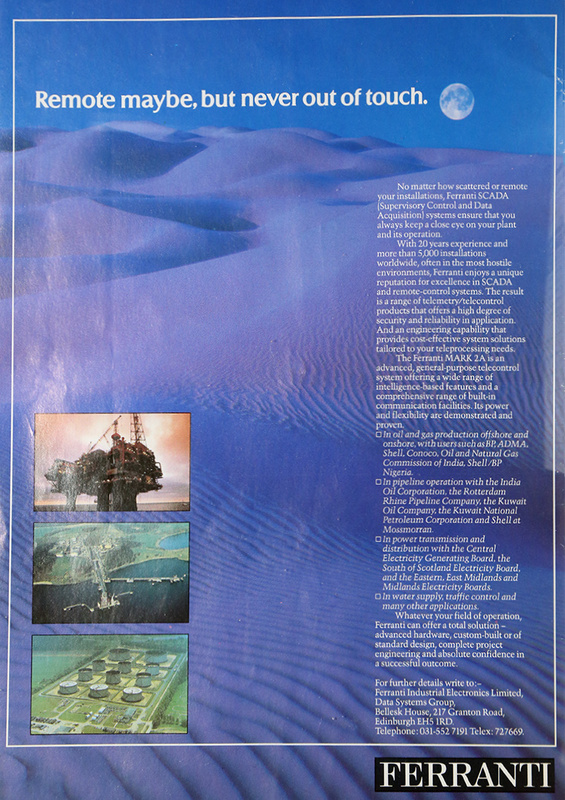 The microelectronics business was sold to Plessey Co in 1988 (or 1986 - see Plessey article). 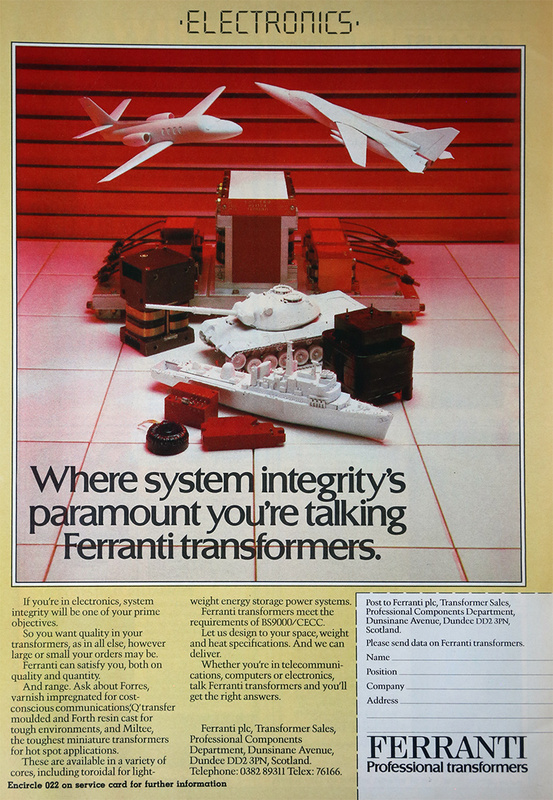 From the late 1980s, Ferranti concentrated on defence sales. Radar systems developed for the Bloodhound Surface-to-Air Missile was a key money earner. 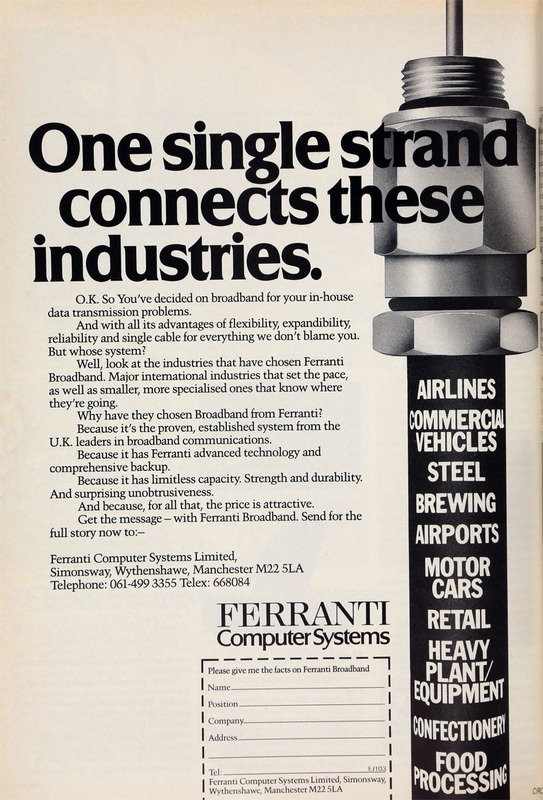 1987 Ferranti purchased International Signal and Control (ISC), a Pennsylvania-based defence contractor, and was renamed Ferranti International plc. Unknown to Ferranti, ISC's business primarily consisted of illegal arms sales started at the behest of various US clandestine organizations. On paper the company looked to be extremely profitable on sales of high-priced "above board" items, but in fact these profits were essentially non-existent. With the sale to Ferranti all illegal sales ended immediately, leaving the company with no obvious cash flow. 1989 The Serious Fraud Office started criminal investigation regarding alleged massive fraud at ISC. 1991 In December, James Guerin, founder of ISC and co-Chairman of the merged company, pleaded guilty before the federal court in Philadelphia, to fraud committed both in the USA and UK. All offences which would have formed part of any UK prosecution were encompassed by the US trial and, as such, no UK trial proceeded. 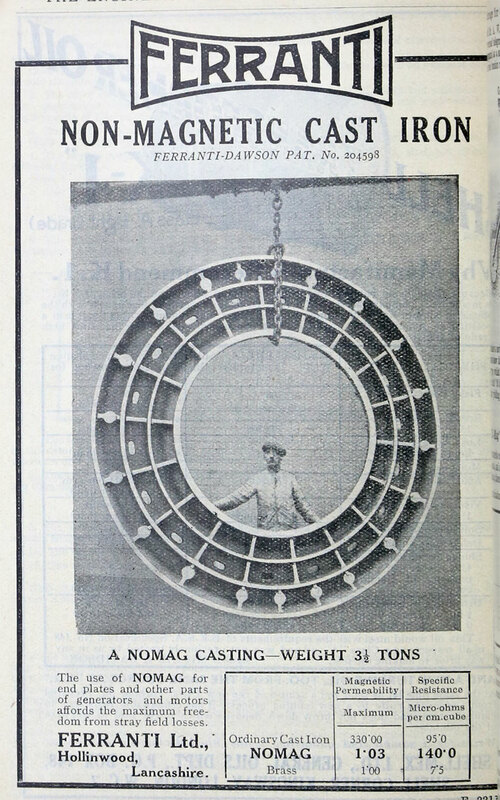 1993 The massive financial and legal difficulties forced Ferranti into bankruptcy in December. 1994 Ferranti was placed in receivership in January after selling many of its divisions. 1996 The computer section was bought out of bankruptcy by a Thomson-CSF subsidiary called SYSECA. 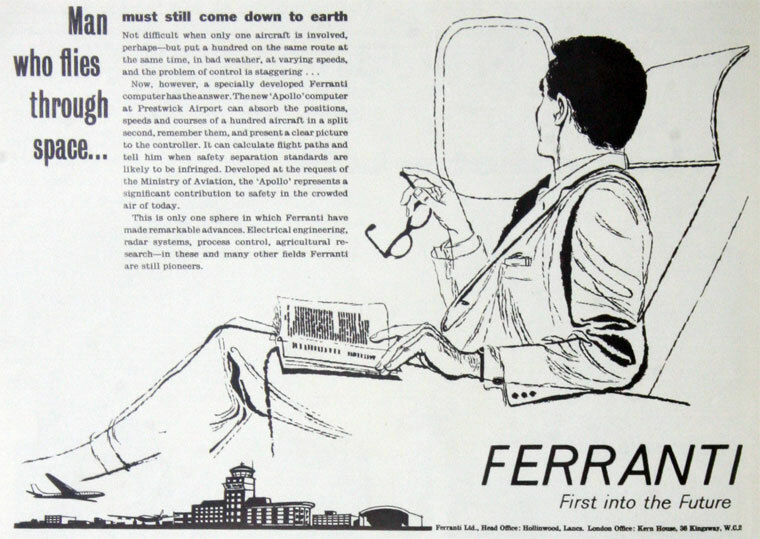 It traded on as Ferranti-SYSECA, until the Ferranti name was finally dropped about 1996. See Wikipedia entry for information on the fate of other branches. 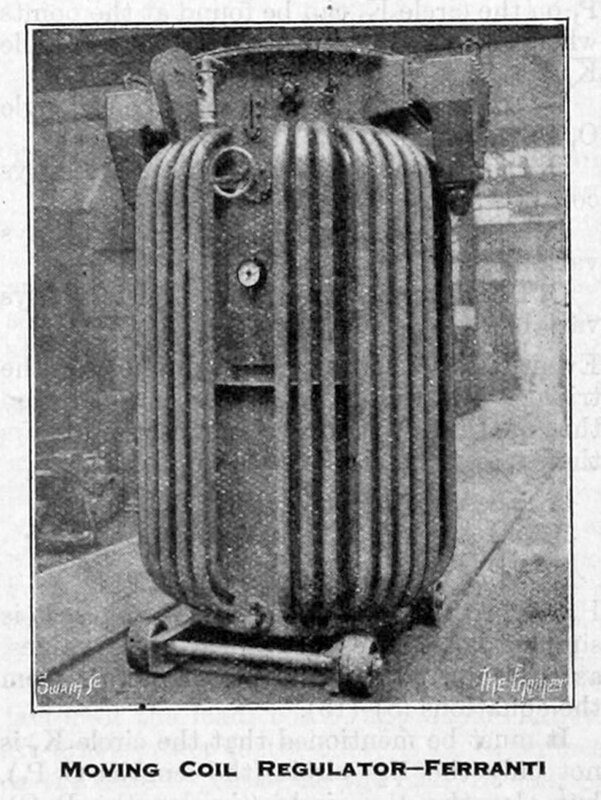 ↑ The Engineer 1900/06/01, p 577. This page was last edited on 15 February 2019, at 09:02.